A bowl full of chicken gumbo. Over rice or not. Runny like a soup or nice and thick like a stew. It all works. There are two types of gumbo. Those made with a roux and those that aren’t. This is the latter. It’s lighter and heavy on the vegetables. As healthy as a gumbo gets I guess. But it’s still damn tasty. Making a roux takes time. 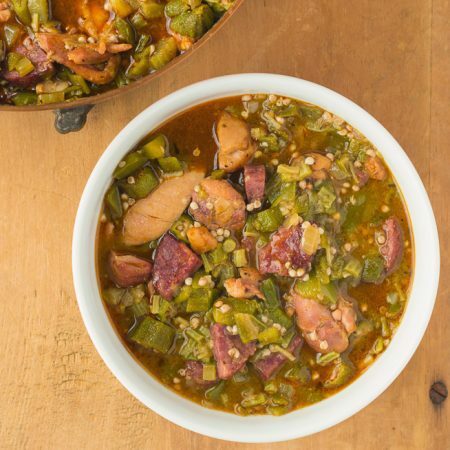 It’s time well spent when you’re looking for that rich, focus on the chicken and sausage kind of gumbo. Can’t beat it for that flashy cajun, explode in your mouth meal. The okra thickens the gumbo some. File powder – ground sassafras – takes it the rest of the way. File powder does more than thicken, it adds a distinctive gumbo flavour. Fresh okra is best in this recipe but this is one of those recipes where frozen sliced okra works as well. 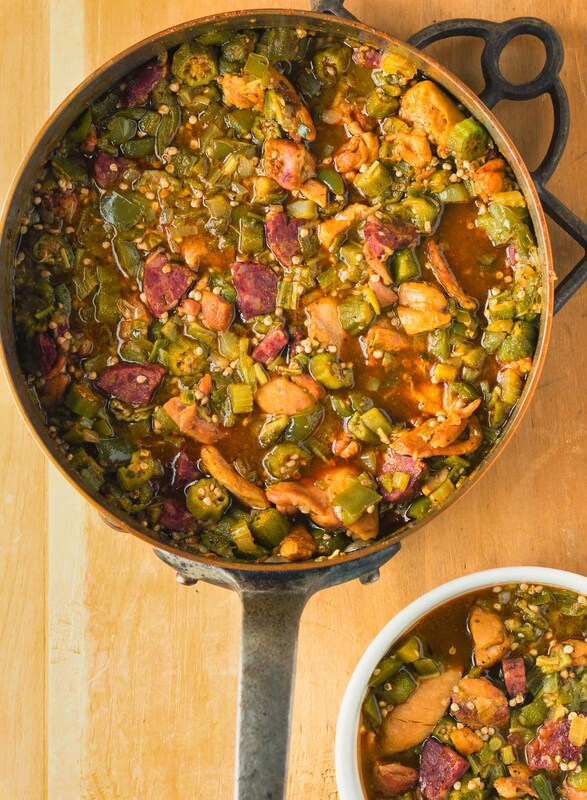 This chicken gumbo uses okra and file to thicken. It's much lighter than a gumbo based on a roux. You can serve this as a main course or thin it with a bit of stock to serve as a soup. Heat oil in a large pot. Season chicken with 2 tsp creole seasoning and cook chicken and kielbasa until the chicken is lightly browned. Remove chicken from pot. Add onion, green pepper, celery, jalapeño and remaining 1 Tbsp plus 1 tsp creole seasoning to the pot. Add more oil if required (you shouldn't have to) and cook, stirring, over medium heat until softened. Add the garlic and cook another minute. Add the okra. It will turn into a slimy mess at this point. Do not despair. It fixes itself. Cook, stirring occasionally until the slime disappears, about 5 minutes. Return chicken, kielbasa and any accumulated juices to the pot. Add enough chicken stock to almost cover (about 1 1/2 cups). Simmer, loosely covered for 20 minutes. Add 1 tsp file powder, stir and simmer another 5 minutes. Serve as is or ladle over cooked rice. Gumbo calls for andouille sausage. If unavailable (as it is for me) substitute kielbasa. Replace the creole seasoning with whatever your favourite is. Just make sure you make sure you don't make the dish too salty. Add additional chicken stock to serve as a soup. In american, main course, poultry. Bookmark the permalink. My sister always grows okra in her garden and I love making gumbo with it. Just another recipe that makes me long for springtime! I’ve never cooked with file powder, will have to give it a try. Pinning for later! File powder really adds a distinct flavour in addition to thickening the gumbo. Hope you give it a try. Haha. Maybe not brilliance but tasty for sure! I am the ONLY person in my entire family that likes okra and I LOVE it the most in gumbo!! May have to stash a recipe of this away in my freezer so that I can get my fix whenever I want it . . . Try it in a curry some time. It’s good there too! Oh man, I absolutely love okra. I’ve always wanted to make gumbo; I’m pinning this one for later! I love okra, I don’t know if it’s just me but it has this awesome umami flavour in it that makes everything oh so delicious!